Jack Young has trained and showed professionally in the past, mostly working cow horses. He has also judged, both Western and English. A graduate of CalPoly at San Luis Obispo, California, he ran the horse unit at Fresno State, in Fresno, California, for four years and coached the judging team. Then he had his own training stables in Fresno. He was around Ray Hunt and Tom Dorrance back in their pre-clinic days, before they became famous, working with Ray for a number of years. He rodeoed a little, and has buckarooed off and on over the years. In central California, he dayworked for Silva's Feedlot, Dutra, and Giffens. In Nevada he worked for the Horseshoe, and dayworked on ranches in Paradise Valley and Orovada, including the Grayson, the 96, the Home Ranch and the UC. 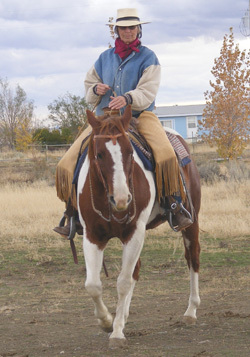 Jack currently does some training, lessons, clinics, and helping with local and state 4-H horse activities. Jan Young has published magazine articles on horses as well as stories and articles for young people. She is a graduate of Fresno Pacific University in Fresno, California. Her middle-grade novels, The Orange Slipknot and Starting the Colt, are about a boy growing up on a ranch in Nevada. For excerpts, reviews and more, go to her website. She is a substitute teacher, teaches women's Bible study, gives piano lessons, as well as helping Jack with training, lessons and clinics. The Youngs live in Winnemucca, Nevada. They have two grown sons.